In terms of both his quantity of work (at least 40 books and several thousand newspaper columns) and the consistently excellent and crystal-clear quality of his writing, I don’t think any living free-market economist even comes close to matching Sowell’s prolific record of writing about economics. 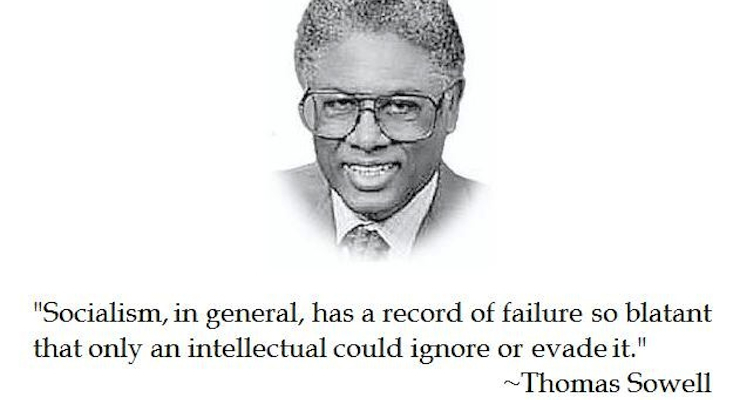 And I don’t think there is any writer today, economist or non-economist, who can match Thomas Sowell’s “idea density” and his ability to consistently pack so much profound economic wisdom into a single sentence and a single paragraph. 1. Knowledge. The cavemen had the same natural resources at their disposal as we have today, and the difference between their standard of living and ours is a difference between the knowledge they could bring to bear on those resources and the knowledge used today. 2. Obamacare. If we cannot afford to pay for doctors, hospitals and pharmaceutical drugs now, how can we afford to pay for doctors, hospitals and pharmaceutical drugs, in addition to a new federal bureaucracy to administer a government-run medical system? 3. Economics vs. Politics I. Economics and politics confront the same fundamental problem: What everyone wants adds up to more than there is. Market economies deal with this problem by confronting individuals with the costs of producing what they want, and letting those individuals make their own trade-offs when presented with prices that convey those costs. That leads to self-rationing, in the light of each individual’s own circumstances and preferences. 5. Predicting the Future. Economists are often asked to predict what the economy is going to do. But economic predictions require predicting what politicians are going to do– and nothing is more unpredictable. 6. Politicians as Santa Claus. The big question that seldom— if ever— gets asked in the mainstream media is whether these are a net increase in jobs. Since the only resources that the government has are the resources it takes from the private sector, using those resources to create jobs means reducing the resources available to create jobs in the private sector. 7. Health Insurance. Whatever position people take on health care reform, there seems to be a bipartisan consensus— usually a sign of mushy thinking— that it is a good idea for the government to force insurance companies to insure people whom politicians want them to insure, and to insure them for things that politicians think should be insured. Contrary to what politicians expect us to do, let’s stop and think. Why aren’t insurance companies already insuring the people and the conditions that they are now going to be forced to cover? Because that means additional costs— and because the insurance companies don’t think their customers are willing to pay those particular costs for those particular coverages. It costs politicians nothing to mandate more insurance coverage for more people. But that doesn’t mean that the costs vanish into thin air. It simply means that both buyers and sellers of insurance are forced to pay costs that neither of them wants to pay. But, because political rhetoric leaves out such grubby things as costs, it sounds like a great deal. 8. Diversity. If there is any place in the Guinness Book of World Records for words repeated the most often, over the most years, without one speck of evidence, “diversity” should be a prime candidate. Is diversity our strength? Or anybody’s strength, anywhere in the world? Does Japan’s homogeneous population cause the Japanese to suffer? Have the Balkans been blessed by their heterogeneity — or does the very word “Balkanization” remind us of centuries of strife, bloodshed and unspeakable atrocities, extending into our own times? Has Europe become a safer place after importing vast numbers of people from the Middle East, with cultures hostile to the fundamental values of Western civilization? “When in Rome do as the Romans do” was once a common saying. Today, after generations in the West have been indoctrinated with the rhetoric of multiculturalism, the borders of Western nations on both sides of the Atlantic have been thrown open to people who think it is their prerogative to come as refugees and tell the Romans what to do — and to assault those who don’t knuckle under to foreign religious standards. It has not been our diversity, but our ability to overcome the problems inherent in diversity, and to act together as Americans, that has been our strength. 9. Greed. Someone pointed out that blaming economic crises on “greed” is like blaming plane crashes on gravity. Certainly planes wouldn’t crash if it wasn’t for gravity. But when thousands of planes fly millions of miles every day without crashing, explaining why a particular plane crashed because of gravity gets you nowhere. Neither does talking about “greed,” which is constant like gravity. 10. The Anointed Ones. In their haste to be wiser and nobler than others, the anointed have misconceived two basic issues. They seem to assume: 1) that they have more knowledge than the average member of the benighted, and 2) that this is the relevant comparison. The real comparison, however, is not between the knowledge possessed by the average member of the educated elite versus the average member of the general public, but rather the total direct knowledge brought to bear through social processes (the competition of the marketplace, social sorting, etc. ), involving millions of people, versus the secondhand knowledge of generalities possessed by a smaller elite group. 11. There’s No Free Red Tape/Obamacare. Do you seriously believe that millions more people can be given medical care and vast new bureaucracies created to administer payment for it, with no additional costs? Just as there is no free lunch, there is no free red tape. Bureaucrats have to eat, just like everyone else, and they need a place to live and some other amenities. How do you suppose the price of medical care can go down when the costs of new government bureaucracies are added to the costs of the medical treatment itself? And where are the extra doctors going to come from, to treat the millions of additional patients? Training more people to become doctors is not free. Politicians may ignore costs but ignoring those costs will not make them go away. With bureaucratically controlled medical care, you are going to need more doctors, just to treat a given number of patients, because time that is spent filling out government forms is time that is not spent treating patients. And doctors have the same 24 hours in the day as everybody else. When you add more patients to more paperwork per patient, you are talking about still more costs. How can that lower medical costs? But although that may be impossible, politics is the art of the impossible. All it takes is rhetoric and a public that does not think beyond the rhetoric they hear. 12. Helping the Poor. It was Thomas Edison who brought us electricity, not the Sierra Club. It was the Wright brothers who got us off the ground, not the Federal Aviation Administration. It was Henry Ford who ended the isolation of millions of Americans by making the automobile affordable, not Ralph Nader. Those who have helped the poor the most have not been those who have gone around loudly expressing “compassion” for the poor, but those who found ways to make industry more productive and distribution more efficient, so that the poor of today can afford things that the affluent of yesterday could only dream about. 13. Income Mobility. Only by focusing on the income brackets, instead of the actual people moving between those brackets, have the intelligentsia been able to verbally create a “problem” for which a “solution” is necessary. They have created a powerful vision of “classes” with “disparities” and “inequities” in income, caused by “barriers” created by “society.” But the routine rise of millions of people out of the lowest quintile over time makes a mockery of the “barriers” assumed by many, if not most, of the intelligentsia. 14. “Giving Back.” All the high-flown talk about how people who are successful in business should “give back” to the community that created the things that facilitated their success is, again, something that sounds plausible to people who do not stop and think through what is being said. After years of dumbed-down education, that apparently includes a lot of people. Take Obama’s example of the business that benefits from being able to ship their products on roads that the government built. How does that create a need to “give back”? Did the taxpayers, including business taxpayers, not pay for that road when it was built? Why should they have to pay for it twice? What about the workers that businesses hire, whose education is usually created in government-financed schools? The government doesn’t have any wealth of its own, except what it takes from taxpayers, whether individuals or businesses. They have already paid for that education. It is not a gift that they have to “give back” by letting politicians take more of their money and freedom. When businesses hire highly educated people, such as chemists or engineers, competition in the labor market forces them to pay higher salaries for people with longer years of valuable education. That education is not a government gift to the employers. It is paid for while it is being created in schools and universities, and it is paid for in higher salaries when highly educated people are hired. One of the tricks of professional magicians is to distract the audience’s attention from what they are doing while they are creating an illusion of magic. Pious talk about “giving back” distracts our attention from the cold fact that politicians are taking away more and more of our money and our freedom. 15. Government Assistance. Do people who advocate special government programs for blacks realize that the federal government has had special programs for American Indians, including affirmative action, since the early 19th century — and that American Indians remain one of the few groups worse off than blacks? 16. Statistical Disparities and Discrimination. Many of us have been so brainwashed over the years — by sheer repetition, rather than by either logic or empirical tests — that statistical disparities are automatically taken to mean discrimination, whether between races, sexes or whatever. The plain fact that different individuals and groups make different choices is resolutely ignored, because it does not fit the prevailing preconceptions, or the crusades based on those preconceptions. Women make different career choices than men, and wisely so, because men do not become mothers, and being a mother is not the same as being a father. And we can’t make them the same by simply calling them both “parents” or saying that “the couple” is pregnant. Discrimination can certainly cause statistical disparities. But statistical disparities do not automatically mean discrimination. 17. Black Lives Matter. We keep hearing that “black lives matter,” but they seem to matter only when that helps politicians to get votes, or when that slogan helps demagogues demonize the police. The other 99% of black lives destroyed by people who are not police do not seem to attract nearly as much attention in the media. What about black success? Does that matter? Apparently not so much. We have heard a lot about black students failing to meet academic standards. So you might think that it would be front-page news when some whole ghetto schools not only meet, but exceed, the academic standards of schools in more upscale communities. There are in fact whole chains of charter schools where black and Hispanic youngsters score well above the national average on tests. If black success was considered half as newsworthy as black failures, such facts would be headline news — and people who have the real interests of black and other minority students at heart would be asking, “Wow! How can we get more kids into these charter schools?” But the teachers’ unions are opposed to charter schools — and they give big bucks to politicians, who in turn put obstacles and restrictions on the expansion of charter schools. These include politicians like New York’s “progressive” mayor Bill de Blasio, who poses as a friend of blacks by denigrating the police, standing alongside Al Sharpton. 18. The Legacy of Slavery vs. the Legacy of Liberalism. If we wanted to be serious about evidence, we might compare where blacks stood a hundred years after the end of slavery with where they stood after 30 years of the liberal welfare state. In other words, we could compare hard evidence on “the legacy of slavery” with hard evidence on the legacy of liberals. Nearly a hundred years of the supposed “legacy of slavery” found most black children [78%] being raised in two-parent families in 1960. But thirty years after the liberal welfare state found the great majority of black children being raised by a single parent [66%]. Public housing projects in the first half of the 20th century were clean, safe places, where people slept outside on hot summer nights, when they were too poor to afford air conditioning. That was before admissions standards for public housing projects were lowered or abandoned, in the euphoria of liberal non-judgmental notions. And it was before the toxic message of victimhood was spread by liberals. We all know what hell holes public housing has become in our times. The same toxic message produced similar social results among lower-income people in England, despite an absence of a “legacy of slavery” there. If we are to go by evidence of social retrogression, liberals have wreaked more havoc on blacks than the supposed “legacy of slavery” they talk about.